Use on engine covers, generator enclosures, bulkheads even in an outboard lazarette. 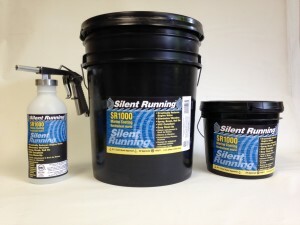 Silent Running SR 1000 has been shown to reduce the noise and vibration from both inboard and outboard motors. Silent Running is significantly lighter than traditional lead foams thus saves weight for the same given area covered. Also due to only being approximately 1/16” thick once all coats have been applied, it saves space as well.